We throw around the word "badass" around these parts quite a bit, but perhaps no man embodies the term more than Mike Ditka. Iron Mike made it into the Hall of Fame by redefining the TE position as a player, but it's his tenure as a cantankerous coach that really cemented his status as a football icon. 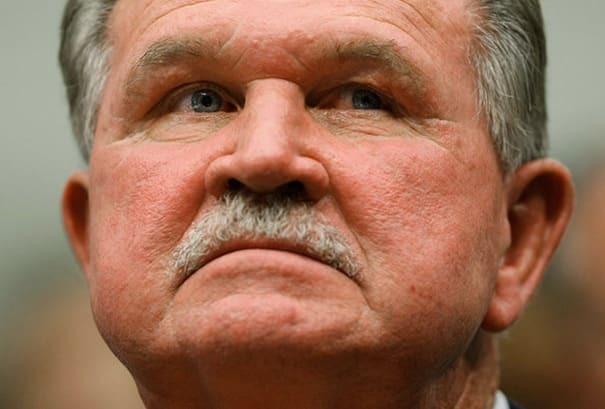 Over 11 memorable years coaching the Chicago Bears (and three not-so-memorable ones with the Saints), Ditka embodied the spirit of old-school, tough-guy football: ornery, aggressive, and always intimidating. He's mellowed with age, but the mustached man is no less entertaining these days as an ESPN pundit and sometime actor. On his 71st birthday, we salute the living legend with this collection of Mike Ditka's Most Badass Moments...believe us, they weren't hard to find.